BLOG BITES — simeon hall jr. It's Christmas and you will only have to make this ham once a year, so don't complain about all the steps. Stop being lazy! First, the biggest question is always what size ham should I buy? I say select the biggest ham that your oven can fit. Hey, left over ham is the best. Thirdly, score the skin of the ham evenly and deeply, but only the skin! This does 2 things. Helps render the fat and makes for dramatic presentation. Before you begin, toast the spices to rejuvenate them. And please make sure they are fresh and not been in your cupboard since Baby Jesus was in a manger. Also, to to measure the honey and syrup, coat the measuring cup with oil so that the slide out without sticking. Add the liquids less the mustard and pineapple pieces and reduce the glaze by about half or until it thickens. Mix in the mustard and pineapple. The Guiness will have bitter notes so if you don't like that flavor profile add 1 less Guiness and 1 more Vitamalt. To roast the ham use a roasting rack or set it on top of a mirepoix. (GOOGLE IT). Roast the ham for 3 hours at 275 rotating the pan every 30 minutes. Start to baste the hammer the last 1 hr of the process. Then blast it for 15 minutes at 400 to caramelize it. Be careful not to let the glaze burn. Remove from the oven and continue to baste. I would also add the ham drippings to the glaze and serve it like a "gravy"! Food, music and the arts. Google Johnny cake and undoubtedly you will run into a history that puts the orgin of these local favorites as somewhere on the Atlantic Coast of America. Go figure! Seems as though they passed over a slew of indigenous Caribbean people, the African slaves, Spanish and English colonizers that were more likely responsible for this recipe. Although I dare not claim that these delights are endemic to our region, I will say that all signs point to the Taino people and the regions invaders as the originals. Albeit in a different form that we see today. One of the major differences of the original recipe from today is that it was most likely made with milled corn, pork fat and no leavening or rising agent. In fact, in some places, it still is. Also, it was probably made with mature coconut water or coconut "rush" which is fresh made coconut milk. Recipes and cooking time would have also been adjusted so that the shelf life on these treats would be longer. They were in fact called, "Journey cakes" because they lasted for days and were a staple for Bahamians tending cotton fields and gone on exploration up through the Americas. Later it became a side and because of the language and diction differences was called Johnny. cakes. Chef notes: The three most important parts of culture are; food, music and the arts. Please help me share the rich food culture of The Bahamas not just to the world but first wiyh each other, especially our kids. They deserve it. Cut the shortening and butter into the dry ingredients until it looks like wet sand. Add the wet and combine. Do not over knead. Mix gently until absorbed. Shape the dough and roll into a square about 1 1/2 to 2 inches. Cut the dough square into equal individual portions. Add to a greased pan and refrigerate for at least 1 hour. Remove and bake immediately. Bake for 12 to 14 minutes at 375 degrees Fahrenheit. 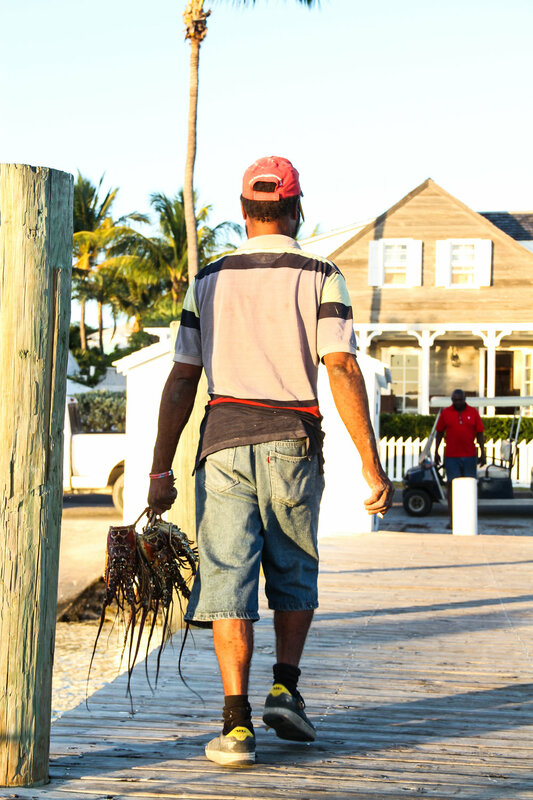 THE TRUTH ABOUT CONCH FRITTERS THAT NO ONE WANTS YOU TO KNOW. Fritters are found in many cuisines. The French beignets, Italian bigne, Jamaica Stomp & Go, and Greek loukoumades are the first type of fritter. 4. The water used to rehydrate the dried conch. 5. 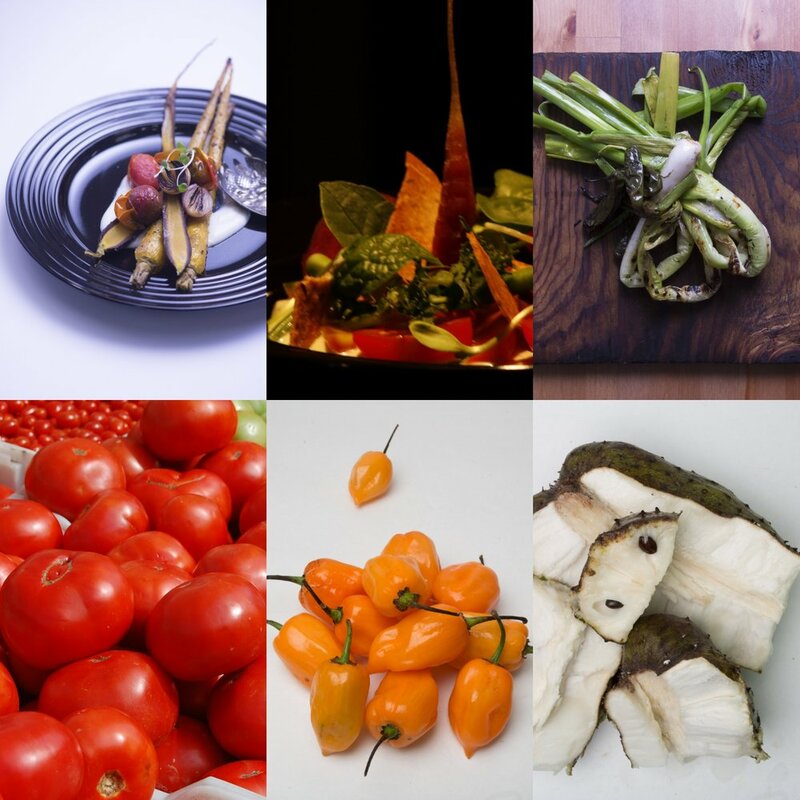 Chopped up vegetables, hot peppers and herbs like wild thyme; A far cry from today's recipes. 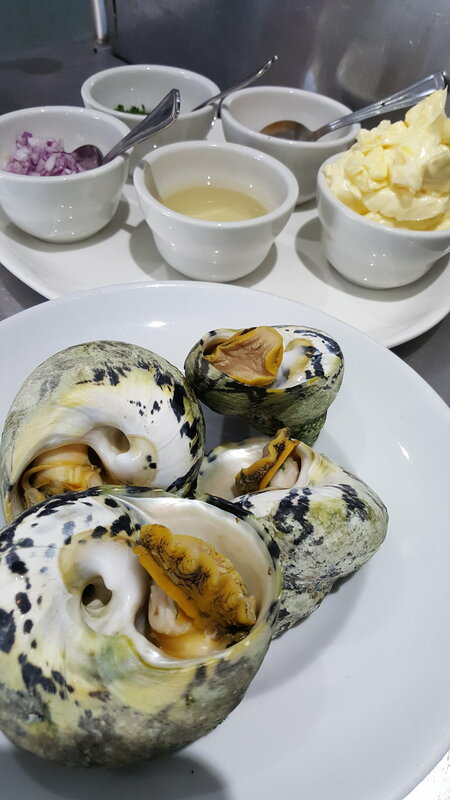 Also due to the lack of refrigeration and the use of dried conch, early conch fritters often had a very sharp tangy taste from the fermentation that naturally occurred. One other important cooking feature of past conch fritter recipes was the smokey notes the fritters often got after being fried in pig fat or lard over open cedar wood flames in a cast iron skillet dedicated only to frying foods. Finally, according to my sources from Cat Island, conch fritters were originally sold 6 for 4 shillings on street corners, parks, beaches and alike by the wives of fishermen in different settlements. They were also served in old newspaper with pepper sauce and not the Calypso sauce (mayonnaise based ) we know today. Finally, finally I don't know about you, but sharing these food facts gets me excited. I think our food history is so much more than tasteless fritters being sold in a hotel for 12 dollars for 6 in some fancy plate. There are so many stories to be told by the food we make and they should be shared. If you have a recipe you want me to explore or one to share hit me up and I will certainly see what I can come up with. Okinawan sweet potato mac salad. In keeping with dropping a recipe or chef tip every day this week, garnering over 5000 visits to www.simeonhalljr.com/blog/, here's my final tip of the week. In Hawaii, no meal is complete without the ingenious serving of mac' potato salad. Yes! Two worlds colliding for an insane yet comforting side dish you must make this holiday season. Peel, large dice and cook the potato and yam until fork tender in salted water. Be careful not to overcook. Cook the eggs using the technique in my previous post. (13 minutes in boiling water then cool immediately in an ice water bath). Rough chop. Prepare the vegetables and parsley, place into a food processor and mince. (If you dont have one just finely chop the ingredients all together). Combine all the ingredients except the poatatoes. By holding them back you won't crush them while mixing the ingredients. Simply fold the potatoes in last and Voila. This has been one of the most amazing recipes I've learnt here and trust me you will see this recipe in times to come from me. 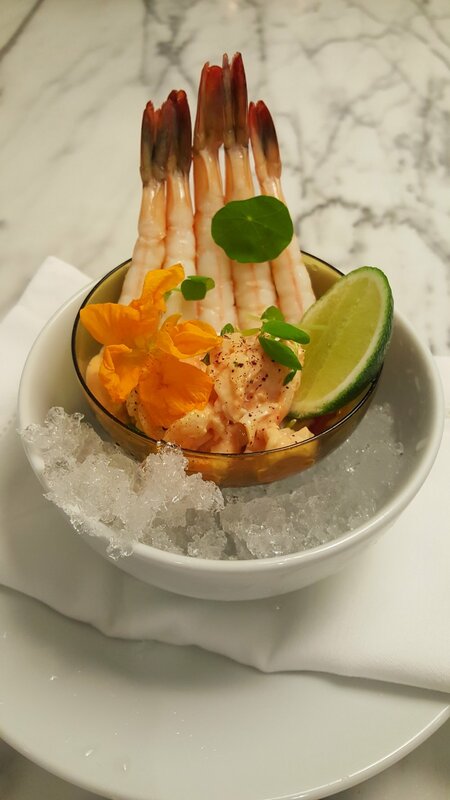 Shrimp cocktail season is here! ANOTHER HOLIDAY RECIPE! "Shrimp Cocktail Season"
So I'm grazing through my latest edition of @bonappetitmag magazine and to my earthly surprise they've stolen one of my topics on page 46 of the December issue. "SHRIMP COCKTAIL SEASON", the exact topic I jotted down maybe 3 months ago for my holiday party topics. Ok, so I'm sure they didn't steal it, but it certainly made me feel like I was on to something sharing this same recipe for the holidays. Just like story's author, Allison Roman, my new hero, I too believe that this should be the common denominator at everyone's party this year. With the addition of a simple cocktail sauce, a pickle (go to simeonhalljr.com/blog/ for several pickle recipes), limes if you're in The Bahamas, lemons in Hawaii and Saltine crackers, people will believe that they've entered a "lit" party if this dish replaces the old candy and nut bowl at the party's entrance. My Bay area inspired sauce. 2 tsp Lea and Perrin sauce. For the shrimp select the best and biggest you can afford and find. Always poach your shrimp shell on and clean after poaching the shrimp. To poach shrimp you will need; 1 gallon water, 1 cut onion, 2 stalks of celery and a clove of garlic. 1 tbsp kosher salt and juice from 1 lime. Bring to a boil and add the shrimp. Cook for around 3 to 5 minutes depending o the size. Immediately cool in ice water and then peel and devein. To serve, set on ice and put out the sauce, limes, pickles and saltines. Then set up a finger bowl station along with a a bowl for the discarded tails and other trash. Pair with your favorite wine, rum or beer to get the evening started. Go to simeonhalljr.com/blog/ for more holiday tips and recipes. So I've been amassing a bunch of recipes for this very moment, Christmas time. And.....this one is a take on a family classic. "Boxing Day Rum Cake Pancakes". I can distinctly remember every Boxing day, the day after Christmas for my non commonwealth followers, when my dad would always make breakfast. 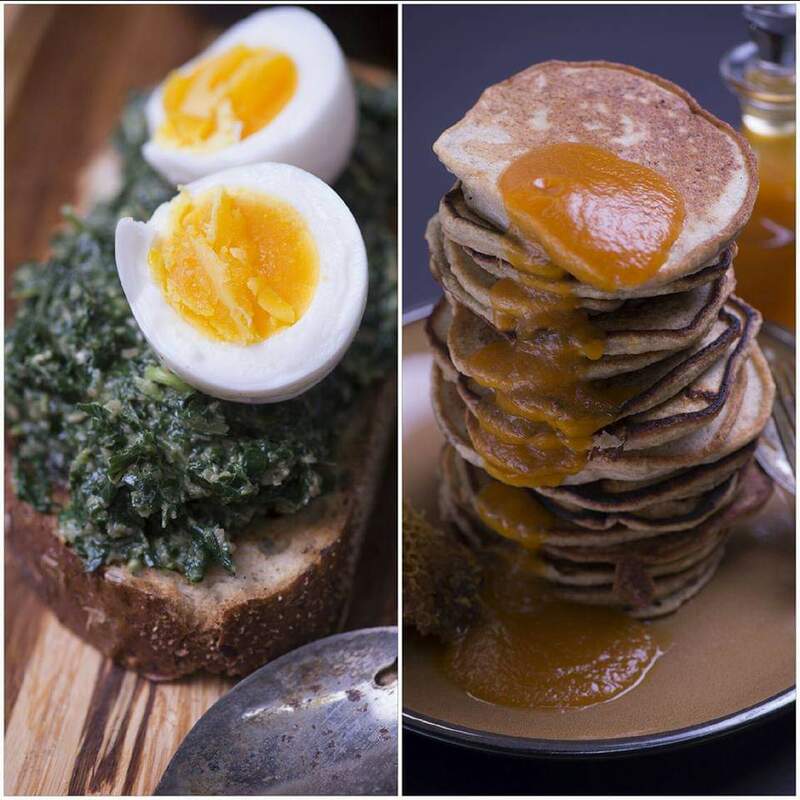 It usually included slabs of fried ham left from the day before, eggs cooked in that same skillet with shards of ham and ham fat ribboned throughout and Bahamian banana "panni-cakes". Fast forward to today and I'm about to prepare you to help create your own traditions. Pancake - mix all the wet ingredients together and sift all the dry together ( with the nuts, add after). Combine evenly without over mixing. Use a cast iron skillet on low and slowly cook the pancakes. Never press your pancakes and only lift when the edges start to bubble. For the syrup warm a maple syrup and mix in butter slowly. Add nuts and finish with rum, without cooking it all the way off. (SORRY THIS ISN'T FOR THE KEIKE). Dust with powdered sugar and whipped cream. Serve pancakes nut side up and syrup on the side so everyone can douse with syrup and enjoy. Serve with leftover fried ham and eggs cooked in ham fat and sediments. SKY JUICE EGG NOG OR GIN AND COCONUT WATER EGGNOG. ITS LIKE JUNKANOO IN A CUP! RECIPE OR THE YEAR! SKY JUICE EGG NOG OR GIN AND COCONUT WATER EGGNOG. ITS LIKE JUNKANOO IN A CUP! This could possibly be my single best recipe of the year! Bahamains and non-islanders alike will love this concoction. You will need a thermometer and a blender for this one. 1/2 cup of your favorite gin or white rum. I'm in Hawaii and I used white @kohana rum for mine. Ok. Here's the tricky, but safe part. You must pasteurize your eggs. To do this let the eggs come to room temperature. (Cold eggs will overcook.) Add the eggs to a heavy bottom pot with room temperature distilled water to cover. Bring it to exactly 138 degrees Fahrenheit and shut it off. The carry over temp will climb to about 140 degrees Fahrenheit and hold it there for exactly 3 minutes. Immediately cool down in ice water, then refrigerate. Now let's get ready for a liquid party!!!! Ensure all your ingredients are cold. The movement in the blender can cook the eggs so be careful. Add the eggs, the condensed milk and cream to the blender and whip. Add the Gin, or rum and coconut water with a finish of nutmeg. Serve immediately over ice and garnish with another shaving of nutmeg and toasted coconut flakes. Ps. Post a picture of your creation and one lucky person will get a bottle of Kohana rum only sold here in Hawaii. I will ensure its shipped anywhere in The World. 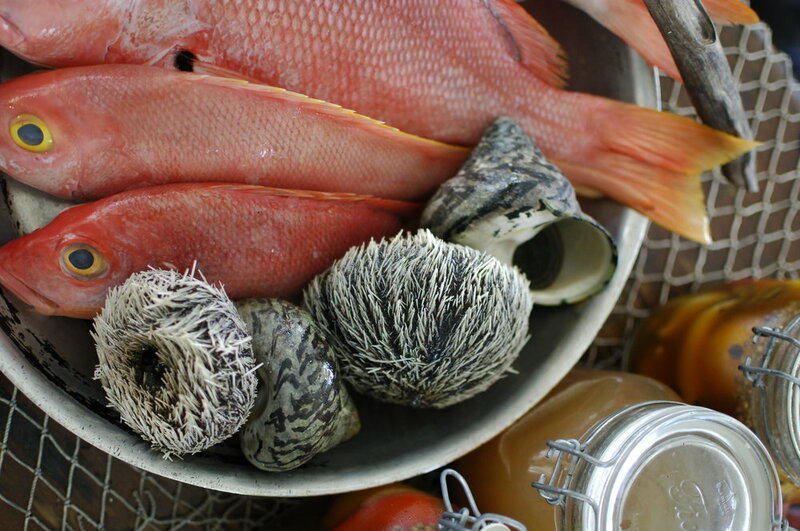 Secondly stop overcooking your seafood and fish, unless you want fried dry, a Bahamian specialty. About 4 minutes one side and 3 on the next. 2. Tomato caper vinaigrette: 1 cup sliced cherry tomatoes/ 2 tsp capers/ 4 pieces of basil, chopped/ 2 cloves slices garlic/ 1/4 cup sliced olives/ 1/2 cup of very good olive oil. Gently warm all the ingredients and season with salt and pepper to taste. 3. 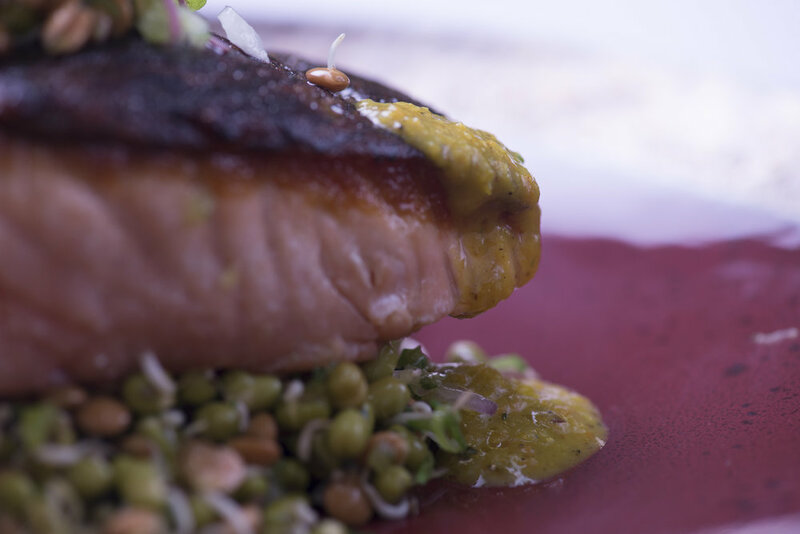 Blackened Salmon with pigeon peas salsa: You can easily purchase a good blackening spice these days or you can make your own but it's very difficult to make a spice that's balanced. SO BUY IT! LOL. To make the salsa medium dice 1/2 cup of pineapple, wash and strain a can of cooked pigeon peas, 3 tbsp of diced red onion and green bell pepper, 2 tbsp honey, juice from 1 lime and a touch of goat pepper if you like heat. I also add a little cilantro and celery leaves chopped to mine as well, but that optional. Mix everything together and just before you are ready to serve it add 1/4 cup of heated pure organic coconut oil and it will be amazing. 4. Cajun crayfish salmon sauce. Alex has precooked crayfish meat at a great price. 1 cup crayfish 1 cup coconut milk 1 glove garlic minced, 2 tbsp tomato paste, a sprig of thyme, 1/2 onion, diced, 1 tbsp blackening spice. 1/4 cup coconut oil. Sauteed the onions, garlic and thyme in the coconut oil. Add the tomato paste and spice. Add coconut milk and then the precooked crayfish meat. Simmer and serve. So many more ideas are coming to mind but start with these! Firstly I'm no Oprah and maybe if im lucky a handful of the 20 thousand combined social media audiences I have will actually take in what I recommend, but that's ok. I do it for them. This is my top 10 list on being a better foodie in 2019. Btw these are in no particular order. If you follow me you know I'm too ad hoc of a writer for that. 10. Unless you have access to the only living soul I know still hand grinds grits on Andros island in a century old mill then I suggest you try if only once, a bag of grits from geechie boy mills. This ain't that instant stuff that taste like cardboard, this is your Grandmithers 28 minute low and slow version that taste like CORN. 8. This maybe the one thing that has made my list 2 years in a row. Qui yogurt by yoplait is simply amazing! Try it and let's argue if you disagree. 7. Digby is another most follow chef that makes my list. 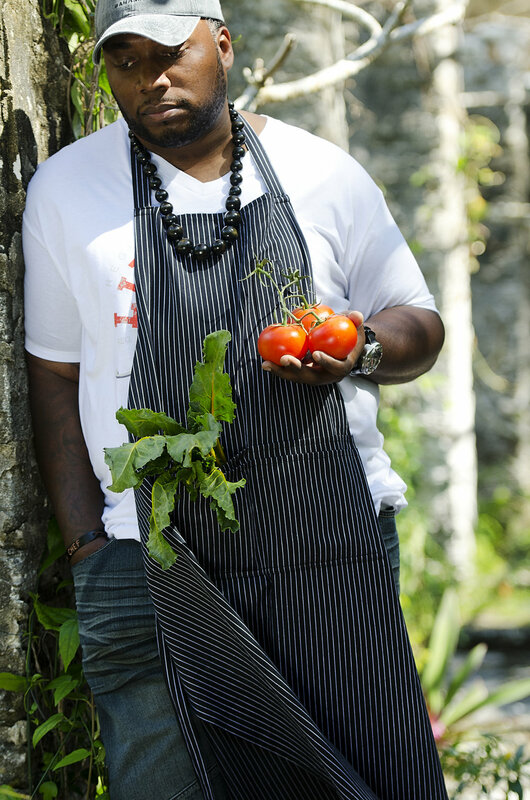 This young chef is a walking encyclopedia of Caribbean food culture knowledge. He just opened his own spot Baraata and I "stalk" his page daily. 6. Try making a food trip to 2 of my top food places on the globe. I plan to in 2019. Charleston and San Francisco. Listen I can't express my love for these 2 places enough. Check it out. 5. I did a post on this dude yesterday. @crazyfarma. 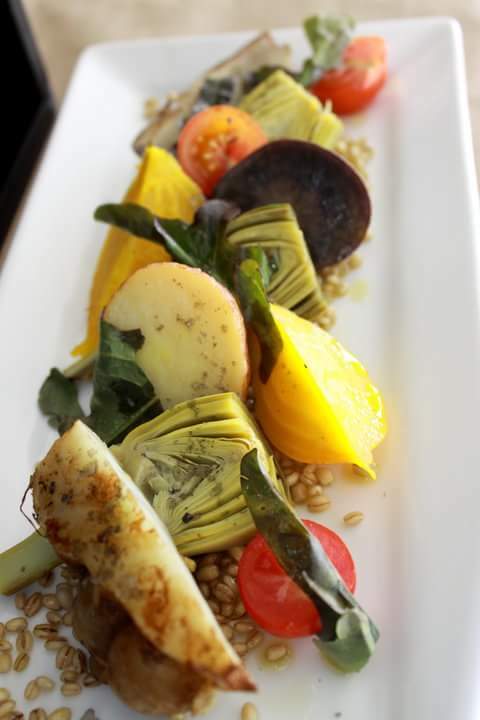 He specializes in edible garnishes, fresh herbs and a few vegetables. If you dont believe me then check him out. Antonio is single handedly changing the game. 4. Bonappetit.com, bon appetit magazines and bon appetit YouTube channel are a must. If there was ever a law that made chefs cite points of reference for their recipes I would list these on top. I consider my style to be "provisional cooking" and if anyone promotes local rustic simple food its them. 3. Pink octopus remains my favorite restaurant in The Bahamas. Full stop period! 2. Use ice. Listen, whenever I make anything raw, green, colorful or shaved I use tons of ice. For vegetables that is. For the exception of petite green or micros you can bring a wilted bunch of friscee bav to life with a little crushed ice and water in minutes. 1. I'm planning something big in 2019. Tag me in your foodie pics and you will be entered for an amazing gift. That's all I can say. Use the hashtag #simeonhalljr. From a new recipe to your favorite meal and boom you're entered. 2. Cannabis affects everyone differently & should be tested & adjusted to your desired effect. 3. This post is for medical marijuana consumption only. 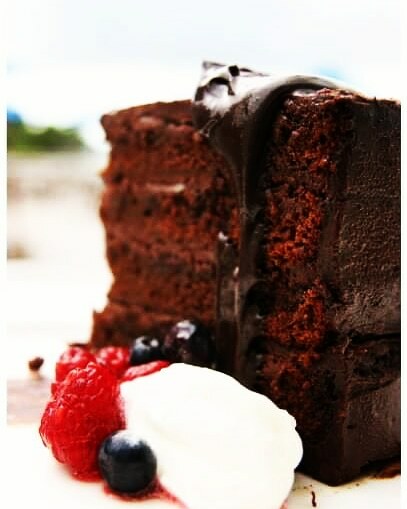 If you bake this cake for your bday party "dats yinna businees" LOL. 4. To put it in simple terms, fresh green Marijuana is virtually ineffective so it has to be dried to do what is called DECARBOXYLATION which is essentially curing the weed to dry it and release the THCA that is needed for absorption in edibles. If using fresh product dry them in the oven set to 245 Degrees Fahrenheit for 30 to 40 minutes. Then using the ration of 1:1 Gently bruises the cannabis into a neutral oil to impart the molecules. I use a mortar and pestle. A spice grinder or food processor damage the molecules releases the chlorophyll to release a pretty color but a bitter taste. Preheat oven to 350° F. Prep your baking pan. You musse know how to do that! sift together the dry. Mix the wet and combine. Bake in a bundt pan for 45 minutes then cool. I use a "special frosting made with herb butter. Make yah own! Food. Music. Arts, Equal Culture. I guess most people would want me to explain why I've been away from my blog for so long, but the truth is, I wont. Anyone that is a true fan of mine would know that I never commit to an explanation of why or why not, but embrace the moment. So cheers to the return of the most exciting blog in The Caribbean, The Bahamas and now Hawai'i. Yes if you don't know I'm now in Honolulu. I've traded in my sandals and shorts for wait; sandals and shorts. Yeap. They couldn't get this island boy to leave what I know and love. Sun sand and sea. Ironic I know. I have however left conch salad for poke and Fish fries for Luaus. (Not sure if that's spelled correctly, but it gives you something to Google and inbox me about). I have however been able to maintain my commitment to local, sustainable and to the storytelling that chefs and farmers are entilled to tell. 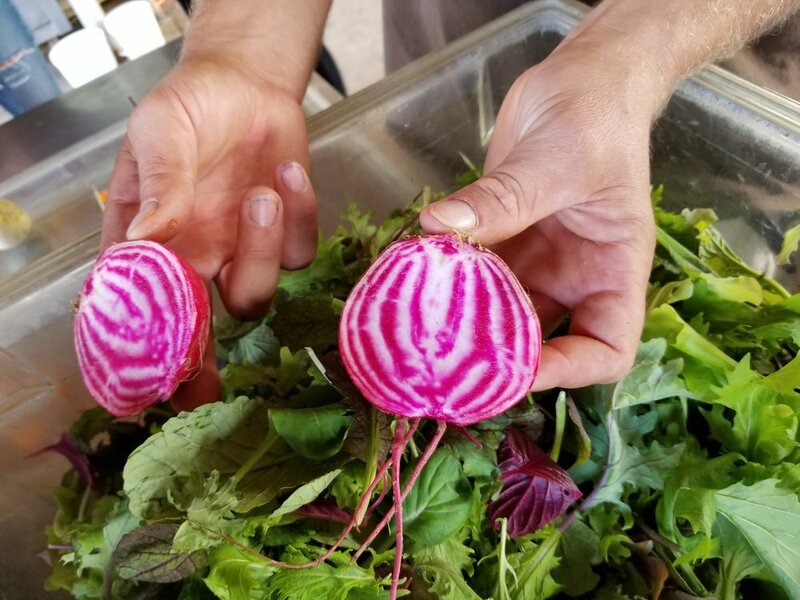 Farmer Christian cutting a candy stripe beets for the team to see. The end of a busy day with the Restaurant service staff members. All that, inspires the focus for me here on this island, but boy do I get Homesick. Hawaii is the most isolated inhabited island chain in the world. We are 5 hrs from L.A. and exactly 12 hrs flying travel time from The Bahamas. So just imagine the feeling of being so far away from family and food culture I love. BUT THERE WAS HOPE. I FOUND GUAVAS. Real authentic guavas........So what else could I do besides make Guava Duff. 1 cup of local dark rum. Using a simple home hand mixer blend the butter until creamy and lighter in color. Slowly add the milks one by one. Then continue to whip adding each remaining ingredient slowly and steadily. The end result should be a sauce light and airy with perfect balance of sweet and "rummy". I very rarely make promises, but I promise you, that this sauce is amazing and worthy to top any pastry authentic enough to be cooked for exactly 1 hr and 23 minutes in a pillowcase in boiling water on top of anyone's stove. For those needing a duff recipe stay tuned. And for those with friends like Chef V please handle my recipe with care and start cooking. 5 Conch Rating System App coming soon. It's amazing how things evolved. I didn't set out to review any restaurant, but to enjoy the great good that Nassau, Bahamas has to offer. Something that by default comes with being single chef. I surmise that my constant posts on social media and my foodie groups made it impossible for me to avoid sharing my thoughts. Want to join me? Let's create a rating system for The Bahamas. A 5 conch rating system. Coming soon. It's going to be awesome. A Bahamian rating system app! BOOM! The dulce de leche flan from Pink Octopus was a bit sweet but very satisfying. The coolest back to school tips ever! Turn your kitchen into a Healthy Grab and Go for your kids! Summer is over, so let's get back at it. No more fast foods and cheating all week long. Pizza night is back to once a week and the kitchen cobwebs need to be swept away. Imagine those grab and go spots in the airports that are filled with healthy options etc. That is what your refrigerator should morph into for this school year. I'm not a parent, but I have an awesome nephew that wants to be a chef and I refuse to ever let him eat from the Kid's Menu. Subsequently, I hate chicken tender and fries or pasta with just plain cheese . So strap in. Call or text a girlfriend. Get ready for the most important blog I've ever posted. Frozen all fruit/ no added sugar popsicles with dry ice. 2. Find a fruit that your child likes regardless of the cost and have it available for snacks. Pay now or pay the doctor later. Let's put the list on pause because I just have to share something I just thought about. Told you I'm bursting with ideas today! Some amazing kids menu ideas. 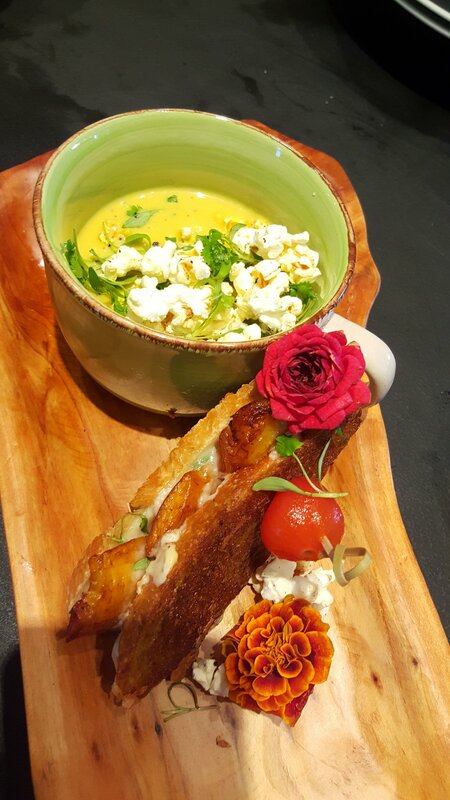 Grilled cheese with plantain sandwich with a side of popcorn chowder . Fruit salad water . Yeap I said it. Get yourself a water infuser bottle and trick your child's water out. They aren't just for your selfies at the gym. Homemade chicken pot pie made with unsweetened coconut milk and tons of vegetables. No pasta vegetable lasagna. I make this all the time for meat and carb lovers and they love it. Instead of just a plain green salad try mixing berries, oranges or mango, gluten free lightly sweetened cereal for an amazing crunch ( most schools forbid nuts due to allergies), parmesan cheese and yogurt dressing. Oh! Try getting them to taste cherry tomatoes. Most kids love them because they are slightly sweeter and fun to eat. Btw here's my yogurt dressing recipe. In a blender add all the ingredients except the EVOO. Which by the way is extra virgin olive oil. Incorporate everything then slowly add the EVOO. Reserve and serve with salads and instead of ranch dressing with raw fun vegetables. Flavored milk. It's not new nor did I event this idea, but you know we are making it awesome again! Recipe. It's so simple your want believe it. 6 large local or organic carrots washed, peeled and diced. Simply add to a high power blender and puree. You can strain the mix but I prefer it unstrained. Roast a chicken or 2 on Sunday and make a GA-ZILLION dishes for the week. Firstly here's my go to quick roasted chicken recipe. FIRSTLY, buy good chicken...... I have a guy, but I suggest you buy Abaco Big Bird or Bell and Evans from Fresh Market. Buy the chicken on Friday roast it on Sunday. You will have to brine it. Optional spices and herbs if you want. Mix the brine and add the whole bird. Be one foe at least 48 hours. Remove the bird and air dry in your refrigerator. Season and roast at 325 for 1 hour. Should be awesome. Roasted chicken leg quaters or dark meat chicken pot pie. Chicken salad with yogurt dressing (recipe above) with craisins, grapes and pine nuts. Chicken noodle soup. The bones make the most amazing stock. The roasted chicken bones cut up. 1 carrot, peel and diced, 1 celery stalk, washed and diced and 1/2 onion diced. 12 dried mushrooms. Shiitake are my favs. Add to a medium pot with water to cover and slowly cook for about 2 hours. Strain and add a few FRESH thyme sprigs. Freeze and use when needed. What we do is all for them. As adults we may have the worse eating habits, but our children and the younger generation need not suffer like we do. Feed them well. Please! Amazing how this all started with this menu. I hope that I can work with schools, restaurants and kid centers around the world to introduce this NEW kids menu and better eating. 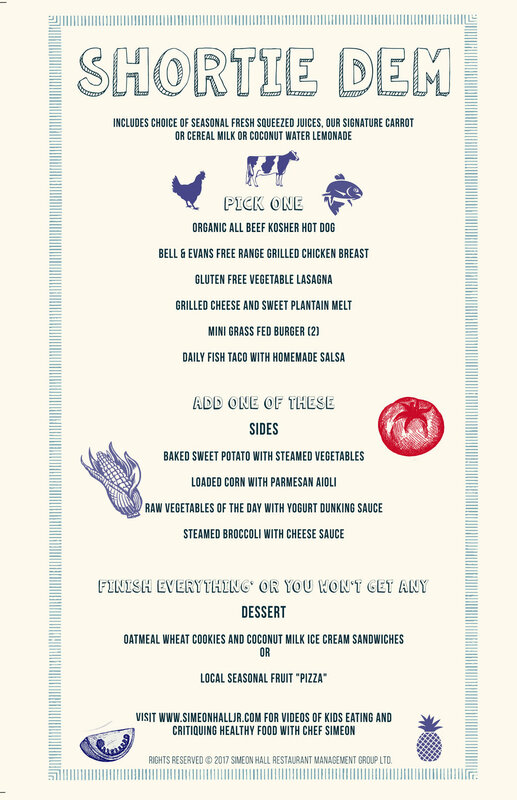 I believe that with your help we can get this style of menu in the hands of those that feed our children. Please like, share and invite others to be a part of this movement! 5 ways to eat like me when you travel! Once again before we get started let me insert my disclaimers now. These are only suggestions that have worked foe me over the years. There is no scientific proof nor any guarantees that they will have similar effects when used by you. Simply put you may not be as charming as me. Who knows? There are surely many ways to get preferential treatment or to eat well when travelling but here are my top five ways. 1. Don't be afraid to mention you are from The Bahamas, if you are that is. Lol. Most people either want to visit our country or they have and want to talk about it. And of course, we all know that once the server flirts, I mean is attentive to you, no refills turn to endless refills and you may even hear about the off menu specials that's are often reserved for special Friends of the restaurant customers only. B. A local farmers market. They often have some of the best artisan food. No matter what you do always budget to eat out well at least once as a part of your trip before you decide on going to your 7th Mall on the trip. 3. Always mention if your having a birthday or any other celebrations. Can you say FREE DESSERT? ALMOST WITHOUT fail. It's a sort of the secret code that most restaurants have not to charge for birthdays and anniversaries. However who knows what honor there is amongst us these days, so be prepared! A free dessert for my nephew for simply being an ALL A student. You find a spot that you like, try going back twice on one trip or even when you return to visit again. Going back for SECONDS is the biggest form of flattering there is. Remember how Nana treated you when you asked for a little bit more of something everyone else seemed not to like, well that! Even try asking for the same waiter or the chef if you got their names. Trust me this will get you the hook up! Free appetizer from my guy Steven at my spot on South Beach Miami. My final tip #5- Last but not least be a generous tipper. Okay I know this seems a bit ambiguous, but let me explain. This point works only if you intend on coming back to this spot like I mentioned in tip #4 or if you are recommending a spot to others. Unlike other forms of profiling, in the restaurant business it's not illegal. However, whether you agree or not we leave a footprint that is often remembered for others to come. Okay lemme just say it because trying to be politically correct is making me seem daft. Tip well so that they know that we Bahamians are often good tippers. Once that happens every Bahamian receives the benefit of the doubt. It works trust me. Listen it's not easy to articulate this stuff sometimes, but you get the drift and trust me if you follow these guidelines your dining experience will for ever change. Ps these work here at home too but....🤣🤣. The top 5 places to eat in The Nassau! Okay, so my lawyer and my publicist both insisted that I put this disclaimer up before I say another word! (Don't hate because I have a TEAM! Just get your own). This list is my opinion and does not represent the claims of anyone else. Those listed have not even been contacted to know they would be mentioned and will only know they are when this list is posted. These restaurants are not perfect, but they provide an amazing experience here in Nassau, Bahamas. Ok the legal stuff out the way, here is my list. Albeit in nonspecific order. - SHIMA. This Thai fusion restaurant located at the Island House Hotel is an amazing spot. The food is aunthetically done and the chef's ability to change and add new items to the menu makes it one of my favorites. Add in the movies located a few steps away and it is an amazing date night spot. - The Pink Octopus... The food gods have definitely visited the chef here in his sleep and gifted him well. The food is innovative and definitely a frequent spot of mine. - The Warwick Hotel. Yeap I said it. This all inclusive joint is redefining hotel food as we know it. The chef here is making sure The Soul of the food is not lost. It is all inclusive resort so this makes it even more fulfilling. Literally. Grab a day pass and go check it out. Last, but not least Lunch @ Dunes. Okay so most of you know that I'm wasn't the biggest fan of this place. That Sunday boil fish "cousin" made me so mad. It wasn't a favorite to say the least. HOWEVER, they have made some changes and to be really honest I go for the bread service and the desserts. Listen to me. Orgasmic. Unmatched. Innovative. Distinctive. And I can continue for weeks describing what pastry chef Angel is doing over there. Don't get me wrong the lunch good but the baked goods are Stupid Good! There are certainly newer spots that I have yet to visit like Manuelos, Thyme, Biggety, Cjay's Deli and that French Bistro at Baha Mar that I've been given great feedback on and so this list will be revisited. But, we will be back. For sure. Please if you have a spot that you want me to check out leave a comment when I will surely visit and give my reviews. Thanks again and no matter what I feel or say remember to always Eat. PRAY. LOVE!